Showing 5 articles from July 16, 2013. 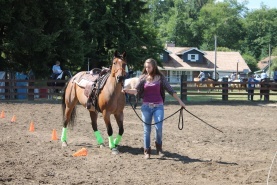 Photo by Kaitlynn Hager Denise McDonald leads her horse, Cruiser, around cones at one end of the challenge arena. MENLO – At the Second Annual Open Trail Challenge hosted by the Pacific County 4-H Volunteers and the Pacific County Fairgrounds, the turnout was impressive. 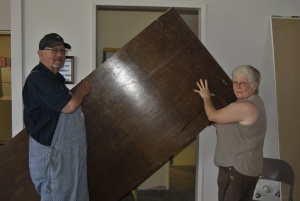 Photo by Kaitlynn Hager Manager Bonnie Ryan and her husband Bob Ryan begin installing the new bathroom door on their handicap accessible facilities at the food bank in Riverdale. Have you noticed anything different as you traveled through Riverdale? Ann’s Boutique has closed and become the expansion to the WHMA Food Bank which was previously located in the back of the building. Food Bank Manager, Bonnie Ryan and her husband, Bob Ryan, chairman, had already acquired the entire building and saw a need for more capacity in the food bank. GRAYLAND – Hundreds turned out for the 28th Annual Westport Windriders Kite Festival. Every type of kite imaginable covered nearly two miles of Grayland Beach. Kite enthusiasts from all around the state and even the nation joined in the mass flying festivities. Even those who came just for the beach were drawn in by the vast array of colors and shapes filling the clear skies. The Raymond Fire Department responded to a fire on Mill St. Monday morning. The firefighters also responded to a fire at the Weyerheuser mill 2½ hours earlier. Please see story on page 5. The Raymond Fire Department responded to two calls Monday morning, including a residence that was a total loss. Raymond Police Chief Chuck Spoor told the Herald that there were no injuries, but that two pet dogs did perish. Two fire trucks and one support were on the scene.